Combining experience, the latest technology and a caring approach to provide excellent care. Christopher S. Lehman, O.D. received his undergraduate degree from Wilkes University in Wilkes Barre, PA. He then went on to graduate with clinical honors from the prestigious Pennsylvania College of Optometry. “Dr. Chris” completed multiple clinical externships including the advanced pediatric and binocular vision externship at The Eye Institute in Philadelphia, where he was recognized for clinical excellence in pediatric eye care and received the Award of Excellence in Vision Therapy from the College of Optometrists in Vision Development (COVD). 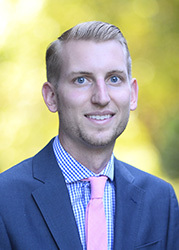 Prior to joining the practice, Dr. Chris completed a residency in Vision Therapy and Rehabilitation at Family EyeCare Associates in Fair Lawn, NJ where he was trained by Dr. Leonard J. Press, who is recognized internationally as an authority in pediatric eye care and vision therapy. During residency, he gained extensive experience working with children and, adults who suffer from eye teaming issues, learning related vision problems, and vision issues related to brain injuries. Dr. Chris also has extensive experience working with developmentally delayed children and adults. He is a member of several professional organizations, including the American Optometric Association (AOA), The Pennsylvania Optometric Association (POA), and the College of Optometrists in Vision Development (COVD). Dr. Lehman is currently working towards his fellowship in College of Optometrists in Vision Development. Dr. Chris currently resides in Phoenixville with his fiancé, Gia, who is also an optometrist. Together they enjoy hiking, cooking, and spending time with family, friends, and their goldendoodle, Humphrey.